Surface refinishing is a proven, nearly 30 year old process, in which worn out or damaged bathtubs, sinks, ceramic tile, fiberglass shower stalls, and even laminate countertops are returned to a like new look and feel without the expensive cost of replacement. Saving time and money are the primary reasons homeowners, as well as hotel and property managers, choose professional refinishing. Cost savings are as high as 75% over replacement or bathtub liners, and the process usually takes only one day. Refinishing always wins when compared to the total cost of tear out, plumbers, and tile setters, plus the time and mess involved with replacement. Redecorating and makeovers are the latest reasons people are using refinishing. You can turn an outdated avocado green tub to white or any color to match your decor'. Refinishing is a cost effective decorating alternative for those who want a total makeover look for their bathroom or kitchen without the total makeover cost and hassle! Avocado green to sparkling white in 2 days or less! Miracle Method takes great care to ensure that the surrounding area is protected and that any unpleasant odor from the refinishing process is properly exhausted outside. The bathtub’s surface is cleaned using a special two-step process to remove soap film, oils, and mineral deposits. Special abrasive materials are used to ensure a thoroughly clean and smooth surface. Chips, scratches and other damaged areas are filled and repaired. The key to a good refinishing job is getting the new finish to stick to the old surface. MM-4, Miracle Method's proprietary bonding agent, is applied to chemically "bond" the new finish onto the old surface. MM-4 is only available through Miracle Method franchisees and ensures adhesion on "glass" surfaces like porcelain and ceramic tile. MM-4 is one of the key reasons Miracle Method has become the nation’s preferred refinisher. It provides superior adhesion and greater durability, plus it is safe to use and handle. Unlike other refinishers, Miracle Method does not use corrosive acids to “etch the surface.” MM-4 eliminates the need for dangerous acids, while creating a superior bond that allows Miracle Method to confidently offer a five-year adhesion warranty on porcelain bathtubs and ceramic tile. An acrylic top coating, in the color of your choice, is applied with a fine finish spray compressor to create a durable, long lasting surface. Finishes are available in either gloss or matte finish, and will dry to the touch within minutes. Miracle Method uses only the most technologically advanced coatings and, through special techniques and procedures, a refinished tub can be ready to use within 12 to 24 hours. Step 5: The extra Miracle Method touch! Miracle Method is one of the few refinishers that uses special procedures to remove dust particles and polish the surface to give a refinished tub its high gloss and super smooth feel. 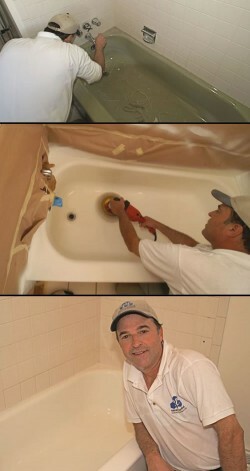 The tub is re-caulked and the work area is thoroughly cleaned to your satisfaction. If you are considering a bathroom or kitchen makeover, click on Find a Location or call our toll free locator number, 1-888-271-7690 to reach the nearest Miracle Method professional.